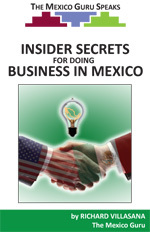 "Insider Secrets for Doing Business in Mexico"
This book is a powerful collection of expert advice distilled through experiences spanning almost fifteen years of doing business in Mexico. This book was written and designed for business people like you who want solid, practical information instead of untested theories. Discover insights into what you will experience as your company does business with Mexico. The most common business situations companies encounter are highlighted along with stories from the trenches. Discover what works and what to avoid so you and your company can enjoy increased sales and profits from doing business in Mexico. "Richard is the real deal! By using one of his strategies, we improved the profitability of one of our Latin American deals by 30%! If you're serious about improving your profits in Latin America, especially in Mexico - you have to implement his strategies and techniques." "Save yourself and your organization thousands of dollars by purchasing, reading and implementing Richard Villasana's 'Insider Secrets for Doing Business in Mexico'. And hurry, before your competition beats you to it!" "Having worked in Mexico, I insist on the importance of having the advice of someone who has the cultural awareness and intelligence that is determinant to successful business negotiations. Lic. Villasana offers this valuable insight and expertise on Mexican business practices in his 'Insider Secrest for Doing Business in Mexico'". "Villasana’s book should be required reading for anyone interested in increasing their business in Mexico. We’ve been dealing with Mexican customers over the years. We were able to immediately apply his advice to upgrade our communication. Our Mexicans customers can focus on our products and services instead of finding cultural mistakes." San Diego Public Library purchasing copies of the first edition of Insider Secrets for Doing Business in Mexico. "After reading Villasana's book I can now see several of the practices I considered to be a standard operating procedure in Mexico probably irked some of the U.S. suppliers we do business with, and now I can compensate for this." "The book is great. What the book offers is an introduction to the importance of 'when in Rome, do as the Romans' behavior." Author of Design To Sell and dozens more. "What you have is so useful to anyone thinking of doing business in Mexico." * eBook purchases are non-refundable.